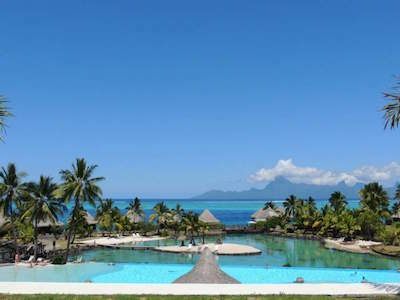 You will be thrilled with the variety of things to do in Moorea! You can take the family on a dolphin swim at the Moorea Dolphin Center or snorkeling in the crystal clear waters of the Lagoonarium or just relax on the white sands of Temae Beach. You can venture through the jungle while hiking the Three Coconuts Pass Trail or travel by ATV to the summit of Magic Mountain or take a coach to Belvedere Lookout where the views of Opunohu as well as Cook’s Bay are perfect. 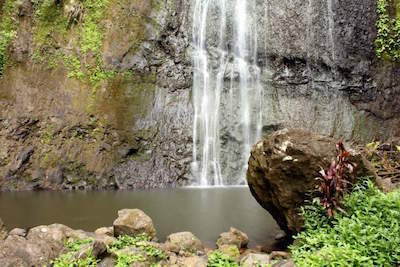 Waterfalls are abundant and Afareaitu Waterfalls features a 100-feet fall of water over cliffs and cultural events can be found at the Tiki Village Cultural Centre. No matter if you are staying on Moorea or just there for a day on a cruise ship, there is a perfect Moorea attraction or activity for you and your family. 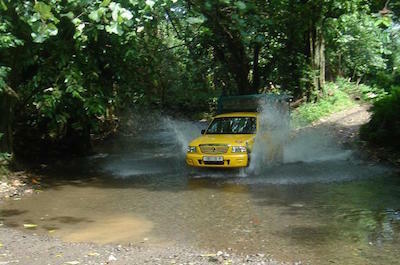 If you are seeking for an adrenaline filled adventure when you arrive on Moorea, then the perfect thing to do in Moorea is to take an exciting 4WD and Off-Road tour. You will be pleased with one of these selections which will give your family insight into the island as well as take you to some spectacular places to view the incredible scenery. You will visit such places as Belvedere Lookout, Magic Mountain and a pineapple plantation. 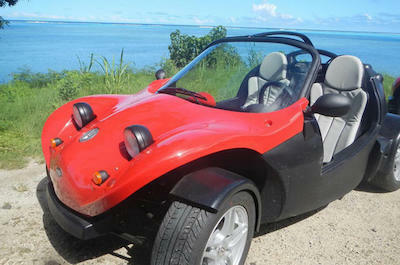 Other places you will visit may include Cook’s and Opunohu Bays as well as drive the beautiful coastline of the island. You can try innovative fruit juices at the Lycee Agricole where the college students are learning to cultivate native crops of the island. Your family will enjoy relaxing while your expert guide navigates the roads and gives you interesting commentary about the history as well as culture of Moorea. If you are searching for a popular thing to do in Moorea whether you are arriving on a cruise ship or staying at a hotel on the island, then try the half-day cultural tour of Moorea. Your 5.5-hour adventure will begin with pick-up service from your cruise ship port or hotel on Moorea where you will begin your adventure with a local expert guide. You will travel to through the tropical environment while learning about the history and culture of Moorea in a comfortable coach. You will visit such spectacular places as Opuhonu Bay and trace the steps of Captain Cook as well as learn about the adventure of the HMS Bounty. You will visit historic archaeological sites, plantations where you will eat exotic fruits as well as learn about the local fauna and flora. There will be plenty of opportunities for your family to take numerous photographs of this memorable day. You can try interesting fruit at the agricultural college on the island as well as view the incredible scenery of Cook’s Bay. You will stop at a local beach for a complimentary picnic lunch before making your last stop to taste innovative fruit juices that are produced by a local company. Your big day on Moorea concludes with drop-off service at your hotel or cruise ship port. When you are looking for an excellent adventure that will take to snorkel with the marine life, then the perfect thing to do in Moorea is to take a lagoon snorkeling cruise and island picnic excursion. Your 5.5-hour adventure begins with hotel pick-up where you will be driven to meet your captain. Once on board you will take a relaxing boat ride to Opunohu or Cook’s Bay while you view the stunning tropical landscape from the water. 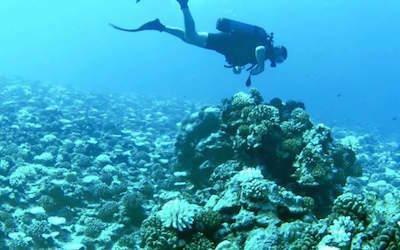 When you sail your captain will have interesting commentary that explains the marine life and the eco-system of Moorea. You will drop anchor and snorkel with amazing marine life like black tip reef sharks. Once finished snorkeling you will continue sailing until you reach a deserted island where you will indulge in a complimentary Tahitian-style picnic lunch, where you will learn how to make the national dish of the French Polynesian islands which is poisson cru. You will have plenty of time on the island to swim, snorkel or just relax on the white sandy beach. Your wonderful day of fun will end with a sail back to shore and drop-off service to your hotel. When you want to set out on your own and view the spectacular sights that Moorea offers, then the ideal thing to do in Moorea is to use a Moorea Roadster Rental. You will have the freedom to choose your own route and vehicle to drive which include fabulous roadsters like a F16 with 600ccs, a mini-jeep, a F440 or a F500. These vehicles are perfect for viewing the scenery with removable roofs and plenty of power to make for an exciting day travel around this rugged island. You can cruise to such fabulous places as Belvedere Lookout, Opunohu and Cook’s Bay as well as stop at Temae Beach for a swim or just to lounge on the white sand beach. No matter what you decide to do, you control your day of sightseeing when you go on your own in a extreme roadster rental. 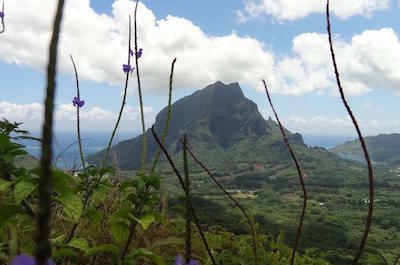 One of the more nature packed things to do in Moorea is to go hiking on the Three Coconuts Pass Trail. Starting from the Belvedere Lookout you will hike along an established trail for 4-miles through the lush tropical environment of Moorea. You will pass through the picturesque Opunohu Valley which is packed with important plants for cooking, making Polynesian tapa cloth and for fishing as well as various birds that your expert guide will explain. After a steady climb you will be awarded with spectacular views of Mt. Mou’a Roa, Mt. Tohiea, Mt. Mou’a Puta and Mt. Rotui. You will even get a chance to refresh yourself in a stunning pool of water at the bottom of a waterfall. 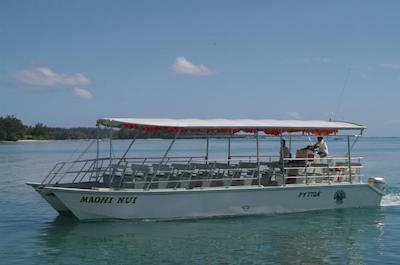 This is a great way to get out and experience the wonder of nature on Moorea. 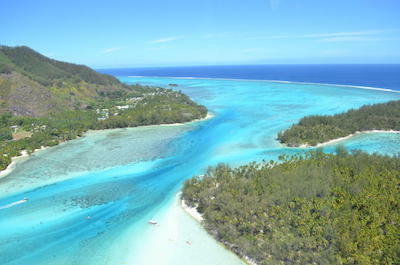 If you are truly looking for a bird’s eye view of the island, then the best thing to do in Moorea is to take a helicopter tour. This 20-minute flight is ideal for couples looking for an intimate time together as well as a grand view of Moorea from the skies above. Once you take off you will feel the adrenaline rush as you hoover above the majestic Mount Rotui and soar around Opunohu and Cook’s Bay. Your pilot will have expert commentary during your flight explaining all the wonderful sights below. You will have plenty of time to take photographs from this prime vantage point of the lush tropical environment that is below. As you follow the coastline keep your eyes open for the marine life below like dolphins, sting rays and whales that are swimming in the multi-colored waters of the lagoons as well as the Pacific Ocean. You might even see a waterfall or two while you are in air. 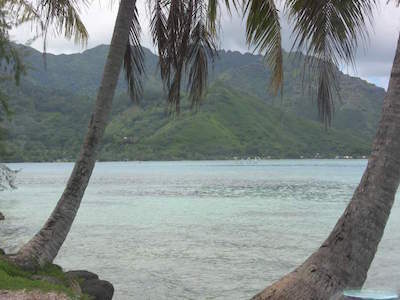 When you land you will have a lifetime of memories of the beautiful island of Moorea. When you are seeking a romantic and adventurous experience, then the best thing to do in Moorea is to go on a Jet Ski tour. This 3-hour excursion is ideal for viewing the entire shoreline of the island as you ride on a one or two seat Jet Ski. You will view exciting places like Opunohu and Cook’s Bay where you can view the magnificent tropical landscape and jagged peaks from the water. As you travel your expert guide will inform you of all the important information about the eco-system and history of Moorea. An added bonus on this excursion is a stop at a small island called a motu where you will have the opportunity to swim with sharks, turtles, stingrays and even view whales during the winter months. When you return to the Jet Ski Club you will be given a special present and transported back to your cruise ship or hotel on the island. If you like history and beautiful scenery, then the perfect thing to do in Moorea is to visit the breathtaking Opunohu Bay. 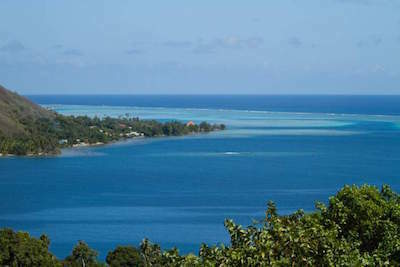 Located on the northern coastline of the island, Opunohu Bay is significant in Moorea history as the place that Captain Cook moored in his search for bread fruit trees in 1777. After the crew of the HMS Bounty committed munity and burned the ship, the crew members continued to thrive within the island’s culture and lifestyle. Today, Opunohu Bay offers great views of Mount Tohiea and is an ideal place to relax on the sandy beaches as well as indulge in swimming and great snorkeling. You can enjoy a drink at one of the many restaurants while you browse the many different shopping venues at Opunohu Bay. You can access other thing to do in Moorea from Opunohu Bay including a road to Belvedere Lookout. 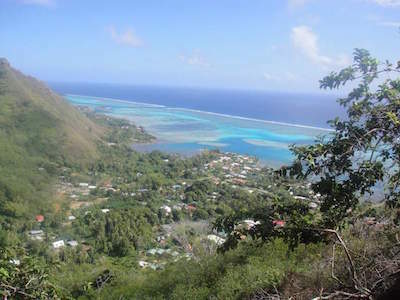 Belvedere Lookout is a superb thing to do in Moorea for travelers looking for a great panoramic view of the island and lush tropical surroundings. Located on the northern portion of island, Belvedere Lookout is a must see stop while visiting Moorea. You can access the summit of Belvedere Lookout on two roads by car, an ATV, scooter or you can decide to hike the Three Coconuts Trail. No matter how you reach the viewpoint you will awarded with fantastic views of Mount Rotui, Opunohu Bay, the Opunohu Valley and Cook’s Bay. Your vantage point includes views of pineapple fields, the lush tropical landscape and views of the many rugged as well as jagged peaks of Moorea. Many travelers decide to visit Belvedere Lookout near sunset where the sky turns into pastel colors before an incredible star gazing show. There is a small snack shop at the lookout as well as souvenirs and you can access several nature trails that will lead you to breathtaking waterfalls. If you are interested in a superb area to swim, shop and just relax, then an ideal thing to do in Moorea is to take a trip to Cook’s Bay. Located along the northern coastline, Cook’s Bay is surrounded by incredible scenery which includes a lush tropical landscape with rugged and jagged peaks which seem to go straight up from the floor of the island. Cook’s Bay offers a great starting point to several hiking trails, restaurants for dining and excellent souvenir shopping. You can also enjoy a variety of watersports at Cook’s Bay from swimming to snorkeling to kayaking or just relax on the beach area. Cook’s Bay is a great place to spend the day no matter what you are looking to do. 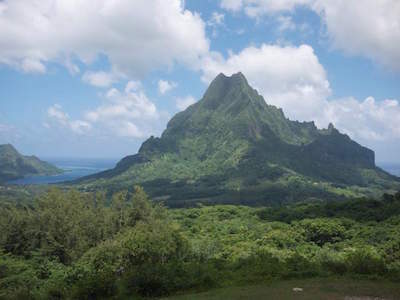 When you want a total panoramic view of the French Polynesian Islands, then the best thing to do in Moorea is to visit the top of MagicMountain. Magical Mountain is one of eight voluminous peaks on the island of Moorea which are rugged and offer spectacular views of the island. Magical Mountain is a fabulous place to take a jeep safari or ATV to the top of the mountain. The road to the top is challenging and you will pass several small villages, a pineapple plantation and have superb tropical valley views. Once at the top the views will include 360 degree panoramic views where you can see Tahiti, hundreds of motus, Opunohu Bay, Cook’s Bay as well as surrounding peaks like Mt. Rotui and the highest point on the island which is Mt. Tohivea. If you are looking to explore the underwater world that surrounds Moorea, then the perfect thing to do in Moorea is for you to visit the Lagoonarium. Located on the eastern coastline of the island near the village of Afareaitu, the Lagoonarium is situated on a small island named Motu Ahi. You will take a short boat transfer from land to the island where you will be amazed at the clarity of the blue water. You can spend your day swimming amidst incredible marine life like sea turtles, multiple species of rays as well as hundreds of tropical fish. You can choose to go snorkeling, help feed baby sharks or just learn about the fascinating marine life that exists around the island of Moorea. The Lagoonarium is remote and you need to bring what you will need for the whole day. If you forget a picnic lunch you can visit the onsite restaurant for casual food and drinks. If you like adventure hiking and climbing as well as in good physical shape, then a superb thing to do in Moorea is to hike/climb Mt. Rotui. Located in the northern section of island, Mt. 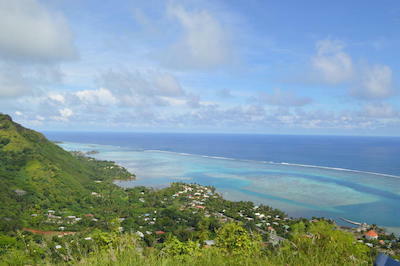 Rotui is the second highest point on Moorea at 2,949-feet above sea level and is flanked by Opuhonu and Cook’s Bay. You may not be able to reach the top of Mt. Rotui but you definitely can get close on this rough 4 to 6-hour hike/climb. There are several access points to this hike and the best is at the Faimano Village Hotel. From here you will follow a trail along the steep north ridge with drop-offs as you follow the trail is over grown with tropical plants but still identifiable. Many travelers decide to take a guide but you can go alone if you are a seasoned hiker. If you are confident then you can continue to the top, if not you might just consider taking in the view from wherever you decide to stop. 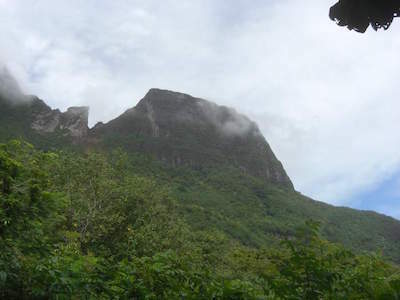 The return hike down can be treacherous when wet, so plan your things to do in Moorea according to the weather. When you want to see spectacular waterfalls, the best thing to do in Moorea is to take a trip to the Afareaitu Waterfalls. Located in the southeastern section of the island, the Afareaitu Waterfalls are situated inland from the tiny village of Arareaitu. The waterfalls are part of two rivers on Moorea which are the Putoa Stream and Vaioro Stream and are accessed by two separate roads. The Putoa Stream contains the larger of the two waterfalls which cascades 100-feet down cliffs into a calm pool of water that is ideal for swimming. Each of the two Afareaitu Waterfalls is accessed by hiking 20 to 30-minutes through a lush jungle landscape and you can also access by 4WD vehicle. To reach the waterfalls drive to the village of Afareaitu until you reach an unmarked road between the protestant church and Ah Sing Market. Sometimes there is a small fee to hike or drive the road. 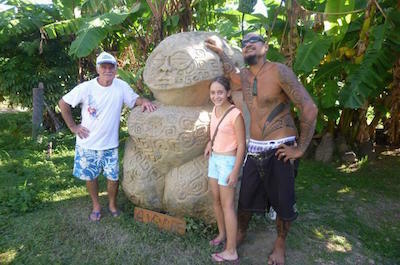 Visiting Papetoai is great thing to do in Moorea to learn more about the early culture and missionaries of the island. Located in the northern coastline of the island, the village of Papetoai is situated on the western side of Opunohu Bay and was founded in 1811 by the London Missionary Society. During the 1870s the missionaries built an octagonal church over a scared marae site. The church is often referred to as the oldest standing European building in the South Pacific and you can visit the tomb of the first missionaries. Today Papetoai is thriving community of artists where you can find unique artworks to take home with you. There is a small shopping center located at the village where you can purchase other souvenirs. You can visit Ta’ahiamanu Beach which is public and there are also several good restaurants such as Lilikoli Garden Cafe, Chez Fifi as well as Snack Taoahere Beach House. 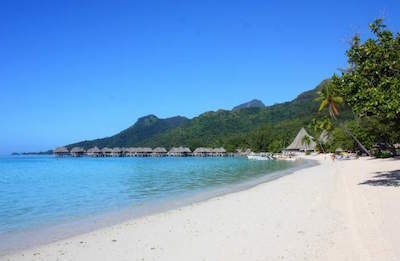 If you are looking for the premier public beach in Moorea, then the ideal thing to do in Moorea is to visit Temae Beach. Located on the northeastern coastline of the island, Temae Beach has beautiful white sands and plenty of space for you to relax. Temae Beach is an ideal spot to swim, snorkel and when it is windy kite surfers take to the water. You can also watch surfers carve the waves off the reef break of Temae Beach. A portion of the beach area is set aside for Sofitel la Ora Moorea Beach Resort but there is still plenty of space for a nice day under the sun. Temae Beach tends to be crowded with locals on the weekends, which makes for great mingling and cultural exchange opportunities. There are no facilities at the beach so come prepared with a picnic and your favorite beverages. If you want a big view of Moorea and an easy spot to stop, then the best thing to don in Moorea is to visit Toatea Lookout. Located on the northeastern shoreline of the island, Toatea Lookout is situated only a mile from Temae Beach. 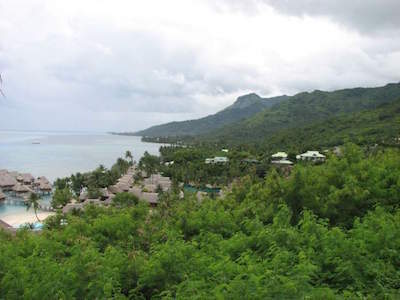 Once at Toatea Lookout you will have gorgeous views of Temae Beach and much of the surrounding tropical landscape including views of Tahiti. The Toatea Lookout is on the main road that circles the island and only a short distance from the airport. Most travelers will get their first glimpse of Toatea Lookout while they are traveling to their hotel while being transported from the airport. You can include this on a day trip to Temae Beach on a scooter or perhaps a bicycle. If you like underwater adventure and watching magnificent marine animals in their natural habitat as well as interesting coral formations, then the best thing to do in Moorea is to go scuba diving. You can dive in such spots as Rays’ Corridor Drift with numerous eagle rays, white tip sharks as well as barracudas and the Tiki Point has hundreds of black tipped reef sharks as well as grey reef sharks. The Opunoho Coral Wall is a spectacular mixture of brightly colored coral as well as hundreds of species of tropical fish and the Garden of Roses boasts superb specimens of coral shaped roses. You can decide to go on a one or two-tank dive and if you are a beginner there are excursions for you to learn the basics of scuba diving while enjoying the beautiful scenery of the underwater world. 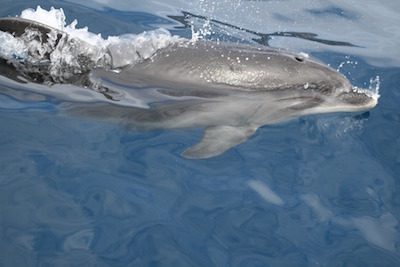 One of the more popular things to do in Moorea is to go on a thrilling dolphin and whale watching excursion. There are many ways you can decide to watch from a catamaran to a yacht to a jet ski to a kayak and even from shore from an ATV or an off-road vehicle. You can go on boat with a party atmosphere or something more romantic like a sunset cruise. An added bonus on some of these tours is that you can choose to go swimming with dolphins, black tipped reef sharks, manta rays and humpback whales as well as enjoy a spectacular view of the coastline that exists on this beautiful island. 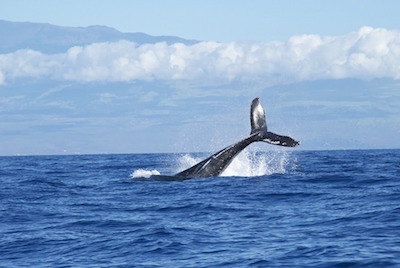 These tours will amaze you while you watch magnificent marine animals swim in their natural habitat. When you are searching for the perfect thing to do in Moorea for your family, then visiting the Moorea Dolphin Center is an ideal choice for you. Located within the InterContinental Morea Resort and Spa along the northern coastline near Tiahura, the Moorea Dolphin Center offers educational and interactive excursions with dolphins. You can take a 30-minute excursion which you will join a marine biologist who will explain the life cycle of dolphins and their habitation needs before entering the pool and touching the dolphin as well as receiving a kiss. A 40-minute tour is very similar with an educational overview of these brilliant animals before going swimming which includes a fascinating free dive while you hold on to your dolphin friend. This is a must thing to do in Moorea when you are interested in learning and interacting with these magnificent creatures. If you are seeking to get out in nature and go for a hike, then the perfect thing to do in Moorea for you is to try the Route des Ananas. Located in the northern segment of the island, Route des Ananas is a series of hiking trails that will take you through pineapple fields, mango orchids and ananas as well as offer great views of Mt. Rotui. There are two entry points for Route des Ananas which are located near Cook’s Bay and Opuhonu Bay. Cook’s Bay requires a 4WD vehicle and most people use the Opuhonu Bay access point. You can wander the well-marked trails until you reach Opuhonu Ranch which is the only working ranch on the island and you can arrange for horseback riding at the ranch. You can also decide to ride bicycles on the trails on your way to Belvedere Lookout. Most people will take these trails while visiting Belvedere Lookout or will travel the 4WD road from Cook’s Bay within an organized tour. If you are searching for one of the few public beaches on Moorea, then the ideal thing to do in Moorea is to stop by Ta’ahiamanu Beach. Located on the northern coastline of the island, Ta’ahiamanu Beach is also known as Mareto Beach and is situated overlooking the crystal clear waters of Opunohu Bay. You will find a beautiful stretch of white sandy beach area that features plenty of space to relax, lounge and mingle with the locals. Swimming, standup paddleboarding as well as kayaking are superb on the calm waters and snorkelers will find a nice coral reef to explore which features hundreds of tropical fish species. You can rent watersports equipment onsite but there are not many facilities at Ta’ahiamanu Beach so bring a picnic. If you are looking to make a day of the trip then stop by Moorea Tropical Gardens and Magic Mountain will give you plenty of opportunities for panoramic photographs of the island. When you are seeking a truly cultural experience and want to learn more about Polynesian history, then the best thing to do in Moorea is to visit the Tiki Village Cultural Centre. Located along the western coastline of the island near the village of Iumaru, the Tiki Village Cultural Centre is the ideal place to watch exciting entertainment, watch traditional art classes and learn about the history of Moorea. As you walk through the village you will view beautiful Polynesian arts and crafts from making flower crowns to pareo painting to Tahitian tattooing to wood carving. After you are finished watching these interesting displays of art, you will be treated to a traditional Tahitian feast which includes Polynesian cuisine from around the islands of Tahiti, Moorea, Bora Bora and even New Zealand. When you have indulged in this incredible dinner, you will do another popular thing to do in Moorea - watch a stunning performance of hula and fire dancers as well as listen to spectacular authentic Polynesian music.